“Don’t judge a book by its cover” is one of those mantras that we’ve all heard. It’s a pretty valid one too – literally and metaphorically – but that doesn’t mean that we can’t enjoy looking at bookcovers and handling beautifully produced books, does it? At least that’s how I see it as a reader. For sellers, it’s a different matter. For them, there is everything to be gained and nothing to be lost in having beautiful looking and feeling books on their shelves. They know that even a nerdy reader like me will be attracted by a gorgeously produced book, will want to pick it up and fondle it and, if content matches the form, will then go ahead and buy it. I am not going to go into the art and economics of book design here, but there is some new thinking afoot with the rise of the ebook. Publishers are starting to think again about form (and content, of course!). If you are interested in the topic, read this Guardian article by Kathryn Hughes. Monday Musings though is about Australian literature and so I’m just going to talk about a few Australian book designers. This will be completely serendipitous because, while I do love to handle a beautiful book, I’m one of those readers who tends to be oblivious to the hard work of those behind its production. So, here goes, with apologies to all those wonderful designers I’ve overlooked. I discovered Gorissen only recently through the books he has designed for Affirm Press. I’ve reviewed three books in the Long Story Short Series and Michael Sala’s The last thread, all of which were designed by Gorissen. On his blog he has announced that he received a Bronze award in New York’s 3×3 Illustration Annual for the Long Story Short series and that the last three books in this series – the three I reviewed – won Gold in the Illustrators Australia Awards for 2012. What can I say? These are beautiful books – just a little smaller than the usual paperback which makes them nice to hold and tote around, and with intriguing cover designs that make you think. 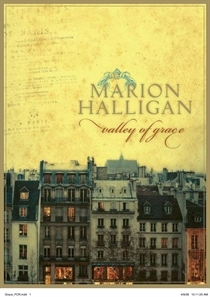 One of my favourite recent(ish) paperbacks – to read and hold – is Marion Halligan‘s Valley of Grace. It’s one of those books that falls open beautifully, making it easy to read. Its font type and size is – yes – easy to read. It has a rich, yellow cover that almost glitters, and yet is subtle at the same time. And, it has flaps, like a hardback. In other words, lovely to hold and read. Cull, who has twice won the APA Best Designed Book of the Year award, worked for Penguin for many years, before setting up her own company, gogoGinkgo, in 2005. In 2010 she started a blog, aboutbookdesign, to “chinwag about designing for the publishing industry in Australia”. It’s worth a peek. Oh, and she judged the Illustrators Australia Awards in 2011, for which Dean Gorissen designed the “call for entries”. My third example of a book I like is a hardback. I tend to prefer paperbacks, mainly because they are smaller and lighter to carry. You won’t be surprised to hear, then, that my favourite hardbacks, from a design point of view, tend to be short books. Murray Bail‘s The pages is such a book. The cover was designed by WH Chong, who apparently works regularly with Susan Miller, an “internal designer”. Chong is a long time designer with Text Publishing, and he too, like Cull, writes a blog, called Culture Mulcher. And, like Gorissen and Cull, he has won awards for his covers. One of his awards was for John Marsden’s Hamlet. You might like to read his comments about it on this Book Design blog. … which brings me to my reader’s manifesto about book design. A book must function well as a book. I do wish more publishers would think about that when they choose binding, paper edges, paper type, and font type and size. There’s so much more to explore about book design – and particularly about how designers are meeting current challenges, not only those presented by the e-book phenomenon but also by the demand for sustainability. Meanwhile, though, you know what I’m going to ask! How important is book design to you, and what are your favourite books from a design perspective? I’ve become a real fan of a minimalist book jacket design, text on a simple color background, for example, instead of a photograph or other imagery. A lot of small independent publishers have gone this way to produce something elegant on a tight budget, and I thoroughly approve. I do tend to like minimalism too Michelle, the “less is more” approach (like the Popular Penguins … they have the recognition factor, and pretend to be nothing other than good content but of course they can do that because their brand has got us in!). Do you have any examples you can name? The Melville House Art of the Novella series is probably the best example I can think of. Again, as you say, they have the weight of classic literature to do the job that a flashier cover might do otherwise. I’ve also really liked the covers from Peirene Press, which is in London and they do strictly translation of novellas. I love their work, and the covers are simple and elegant. Thanks Michelle. I’ve bought a couple of Peirene Press books as gifts but haven’t yet read one myself, but they are gorgeous as you say. I’ll look out the Melville House ones as I do like novellas for a start. The great fault of American publishing is the clumsy hardback. My unscientific guess would be that an American hardback book takes up 30 to 50 percent more space than the British edition would. I have wondered whether it is because there is that much more space to fill up here than in Europe–one could build bigger houses, and commonly one had to build rather than inherit a library. I noticed that the author and book dealer Larry McMurtry–who has moved his operations to Archer City, Texas, where there is plenty of space–expresses a preference for British books as better made. Interesting point George. I hadn’t thought that about US versus UK hardbacks but now you mention it, the US ones I’ve bought over the years do seem clunkier. I read an article recently about McMurtry’s huge bookstore … Must go to Archer next time I visit the USA. I really like the NYRB Classics book designs. They look so pretty on a shelf together. While I do like a well designed book, I generally don’t pay much attention to it unless it is a book or author I am not familiar with then I notice things like the cover but I can’t say I ever pay attention enough to bother figuring out who the designer is. I appreciate their work when it is good, but they go rather unsung. You sound like me Stephanie. It’s only been in the last year or so that I’ve started becoming aware of book designers. I’d love to know more about their thought processes – the designers and the publishers who pay them. I love hard covered books and appreciate even more special editions. I don’t mind US hardcovers, they have special characteristics that don’t appear in UK bound books, like uncut pages. The most recent book design that I loved for its quirkiness and cleverness was the US hard cover edition of Murakami’s 1Q84, with its transparent cover. But personally i consider the golden age of book covers was during the late 1960s to 1970s, where a lot of thought was put into the appearance of the book, even the humble paperback. Penguin book covers at that time were wonderfully stylish and beautifully designed. People tend to collect old Penguin books these days as much for the cover design as the contents. And I have, in my Eye Candy for Bibliophiles blog been displaying the old books in my personal library, scanned with all their original covers. Sorry Anne, I’ve just discovered duplicate versions of this in my spam folder (along with another commenter for whom there were also duplicate comments in the spam folder). I have seen your other blog. I agree that there are many hardbacks – particularly special editions – that are just delicious. I think my general preference for paperbacks is mainly a practical one re ease of carrying and reading. That’s interesting about the late 1960s and 1970s. I wouldn’t have realised that … but Penguins from then are beautiful (as I recollect). I really like the design of The Pages too, but my all time favourite is Robert Dessaix’s Night Letters. My son gave it to me as a gift, and it is slim and elegant and so lovely to hold as you read it…. Oh yes, Lisa … I think I read someone else’s copy of that but I do recollect it. A nice one. Ah Stu, I found Trieste on your blog. That’s a good one – it seems to combine minimalism with boldness which is a pretty hard-to-beat combination. Good point Hannah … comparing covers (and titles too) between countries is another whole topic. With people now buying books online I am now seeing a greater variety of bookcovers at reading group, and it’s rather fascinating to think about why. I think we can, too, Nigel … more or less. After all, he chose us. MJ Hyland is a different think altogether as she was brought here by her family and is now living in the UK. I feel uncomfortable counting her. I haven’t read any of those books though I do have Summertime in my TBR. Must go look at it. Oh and I should say I’ve read all three authors, but not the particular books you list. Sorry about the duplicated entries as I was trying to post a comment without success, so kept on trying..
Oh no need to apologise, Anne. I’m impressed and grateful that you kept trying. I must check the spam more often.